With this special, in exchange for a signed Model Release (allowing me to use images from your session in my print/on-line marketing materials and in my on-line galleries), I will be offering a reduced Creative Fee and you will have the opportunity to purchase prints or digital images after viewing your on-line gallery, at a 50% discount. There is absolutely NO obligation to purchase anything from your session, and there will be NO minimum orders. I will also provide you with 1 FREE digital image from your session for on-line sharing! Contact me soon to schedule a session, as I will have limited availability! 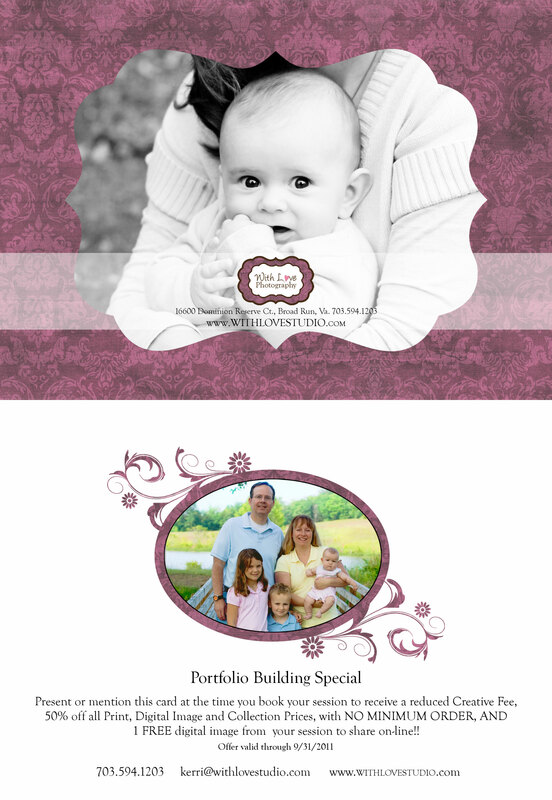 I look forward to capturing some wonderful family moments that you can reminisce upon for years! I’d be intereseted in scheduling a session with you this summer. Please contact me with pricing details. Thank you!